That’s LBi in a nutshell. We’re passionate about our work, dedicated to our vision and committed to our clients. We strive to be worthy of recognition. But receiving recognition is not why we do what we do. On the other hand, like most any other business, when recognition comes our way, we’ll accept it — particularly when it comes from a source we respect. 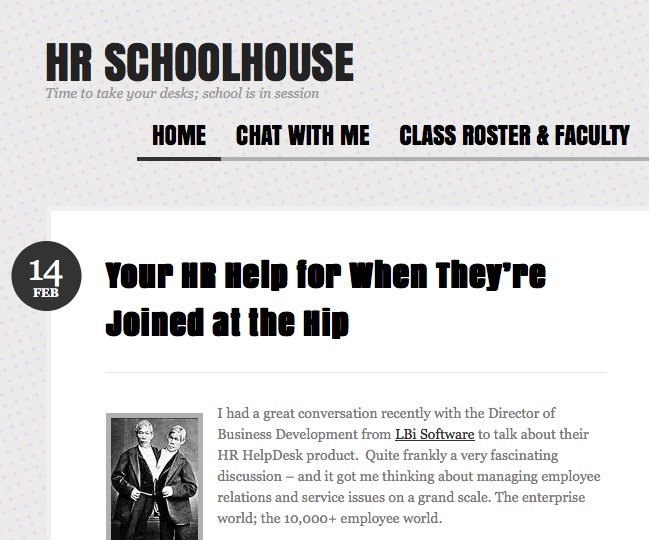 So on Valentine’s Day, we were happy to see we were featured in a post by Robin Schooling, SPHR, on her blog, HR Schoolhouse. As Schooling says, LBi HR HelpDesk has the power to help HR detect employee concerns and discontent before they can escalate and affect performance to that level. It precisely defines a key benefit of LBi HR HelpDesk. And we’ll gladly accept recognition for that.